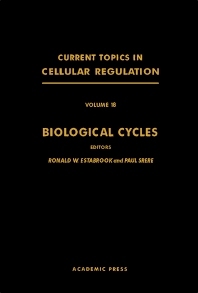 Current Topics in Cellular Regulation, Volume 18: Biological Cycles covers topics on the events of molecular biology, cellular communication, and the merging of cell structure to biochemical function. The book discusses the ornithin-urea cycle; the cycles of glutathione metabolism and transport; and the role of multienzymatic proteins in mammalian pyrimidine biosynthesis. The text also describes the significance of interconvertible enzyme cycles in cellular regulation; regulation of mammalian pyruvate dehydrogenase complex by a phosphorylation-dephosphorylation cycle; replenishment of citric acid cycle intermediates by the purine nucleotide cycle in rat skeletal muscle. The control of a secondary pathway of ethanol metabolism by differences in redox state; the role of aldolase and fructose bisphosphatase in the control of gluconeogenesis and glycolysis; and the fructose 6-phosphate/fructose 1,6-bisphosphate cycle are also considered. The book further tackles the cycles in polysaccharide biosynthesis and other important biological cycles. Biologists, microbiologists, cellular biologists, and biochemists will find the book invaluable. Veterans Affairs Medical Center, Dallas, Texas, U.S.A.